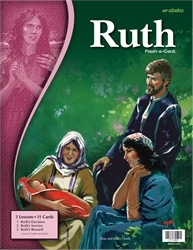 Inspire your child with Ruth’s faith and devotion that have touched many over the centuries. With these beautiful visuals your child will come to love her story as well. Help your child learn how to be wise and faithful in making decision just as Ruth was. Made from sturdy cardstock, these wonderful picture cards will make Bible time even more captivating for your child.